Need a break? 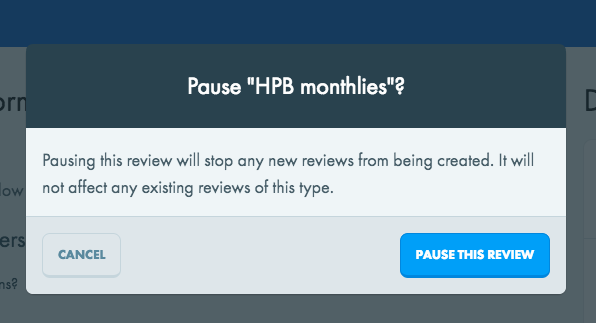 You can pause a recurring review type to stop any more reviews of that type being created. Note: Pausing a review type will only stop new reviews of that type from being created. If individuals reviews have already been created and you don't want them there, you will have to delete these separately. Head to the reviews section. Chose the review type you want to pause and click on the eye icon to view the details. In the details section, toggle the "live" switch to pause. The review type is now paused. To make it live again, come to the same place and switch the toggle to live.